Dyson V8 Absolute Cordless Stick Vacuum Cleaner is the ultimate cleaning solution for the householder to deep clean carpet and pet hair with its powerful motor, suction tube and crevice tool. The V8 power button is separated from the trash bin so it is easy to press the button. Cordless so hassle-free, lightweight (Only 5.75 pounds), versatile for cleaning and it has a powerful suction tube with a crevice tool. Up to 40 minutes running time when using a non-motorized tool and can run up to 8 minutes in its max mode. Drives stiff nylon bristles into carpets pile to capture deep-down in dirt and pet hair. It can capture 0.3-micron particles by the jet filters, pick up ground dirt and fine dust from hard floors, carpets, ceiling. It has 150% more brush bar power than the Dyson V6 cordless vacuum. 15 cyclones, arranged across two tiers, work in parallel to increase airflow and capture more fine dust and pet hair. Hygienically drive out trapped dust and large debris in a single action by its HEPA filtration system. There’s no need to touch the waste because it has a separate trash bin. Bin volume is 0.14 gallons. Hoover Linx Cordless Stick Vacuum Cleaner is part of the latest generation of the light vacuum cleaner. It is one of the best electric broom available in the market. This vacuum has 2 major advantages that make it such a versatile and usable appliance, its lightweight and the absence of the power cord. It is great to use on the bare floor, rugs and low pile carpet with its suction power for its Wind Tunnel technology with one air tunnel can gather most of the particles in one swipe. Rechargeable Lithium-Ion battery with 18 volts can run 15-20 minutes and has multiple cleaning modes. Easy access on power switch located on the handlebar. Its Cyclonic Technology can clean the carpet and pet hair and the filter is washable. Bin volume is 0.23 gallons and easy to empty the trash bin. Only weight 7.30 pounds, definitely a lightweight and versatile vacuum cleaner with 2 years warranty. The Dirt Devil Simple-Stick Lightweight Corded Bagless Stick Vacuum Cleaner is a versatile, lightweight vacuum that is very easy to use, easy to empty dirt cup and store in the house. Its three in one design gives the harmony of a corded stick vacuum, the portability of a handle vacuum and the cleaning power of a utility vacuum. Another wise electric broom vacuum cleaner for you. Advanced and original stick vacuum consists of an easy off separable hand vacuum and it can assure the formation quality to easily get into constricted spaces. Weighs less than 4 Pounds- lightweight formation for comfortable carrying to any location where its cleaning power is needed. Smooth-rolling wheels and convenient cord wrap for 16-foot cord and the switch is very handy to operate. 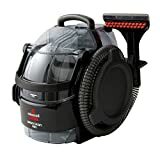 25 Amp Motor- cut through messes with constant suction power and give quick speed and it has an F25 filter that catches annoying dirt and dust particles in 1 swipe. 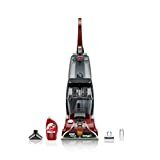 Dyson V8 Absolute Cordless Stick Vacuum Cleaner, Hoover LINX Cordless Stick Vacuum Cleaner BH50010, Dirt Devil Simple-Stick Lightweight Corded Bagless Stick Vacuum Cleaner SD20000RED these three are the best electric broom in the market. You can get different benefit from different one. You have to choose one according to your own needs.